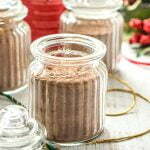 This homemade low carb cocoa mix makes a great gift for friends and family on a low carb diet! It takes only minutes to make and with a cute container, ribbons or bows you have an easy homemade gift. Or just keep it for yourself for those cold winter days. NOTE: Before you start do a test with 1 tablespoon sweetener + 1/2 tablespoon cocoa + 1/2 tablespoon powdered cream. Mix with 8 oz of hot water. Test to see if you like it sweeter and adjust accordingly. I prefer it less sweet. Pour into a sealed container. Use 2 tablespoons per 8 oz of hot water. *** Note I preferred Guittards or Divine cocoa rouge for it's intense chocolate taste and less carbs. You can find all of these ingredients on my Amazon page. Please use Swerve confectioners as it dissolves much easier than granular.